Whether you are planning to sell within the next week or the next six months, it's important to ask yourself some key questions before listing and planning to market. It's important to know really why you must to sell and when is a good time. Should you be selling now or wait until spring? What benefits you have by selling now versus waiting three or six months? Do you think you should sell to cash in on a higher real estate prices because that's what's going on in the market right now? What's the real reason for selling? Did you find a better house? Are you moving up or downsizing? Once you understand the why, you can make a better decision on the when. #2. What's the next plan of action? Will you do once the house sells? Do you have a house that you're planning on moving into and whose directly involved in the move such as family members? Will this affect your job, commute, family status? Are you nearing retirement age where you might be looking at an active adult community or will you need to buy another house before that time? Make sure you have a good plan of action set up for after the home sells so you don't feel stressed about the next move. #3. Who will the buyer be? What type of buyer will be attracted to your type of house? Are you selling a condominium, single-family house, farm, large acreage, or some other type of property? Real estate owners benefit from a seller's market with will receive top dollar quickly and sell fast. Do you think your best price will come from first-time buyers or people that are middle-aged moving up or downsizing? If your buyers are first-time buyers, mortgage rates might be appealing to them so selling in the market with lower rates might offer the best return. It's also important to think of any upgrades that your home may need to prior to selling. Would a major renovation be a good investment? What would most buyers be in favor of to increase the value of your home? #4. Who will help you with the sale? Whether you are selling next week or this year, start now by doing some research on the right real estate agent or brokerage to handle the sale. It's okay to interview several Realtors® to find the best one for your needs and when you are comfortable with. You want to find someone that's familiar not only with your city but your neighborhood as well. Find it agent that not only helps buyers but lists and sells properties on a regular basis. It's important to find a full-time agent rather than someone that just "does real estate" on a part-time basis. #5. What does a successful sale look like? How much are you going to need from the sale of your property? Run the numbers as far as comparable sales, how much your mortgage payoff would be, taxes, closing costs, and any other fees that come with selling the property. A great real estate agent will be able to price your home well and offer you suggestions on lowering your price if necessary and how much profit you're likely to gain. Planning now will help set you up for a successful sale whenever that is. A great real estate agent can also time the market so that you list at the right time. 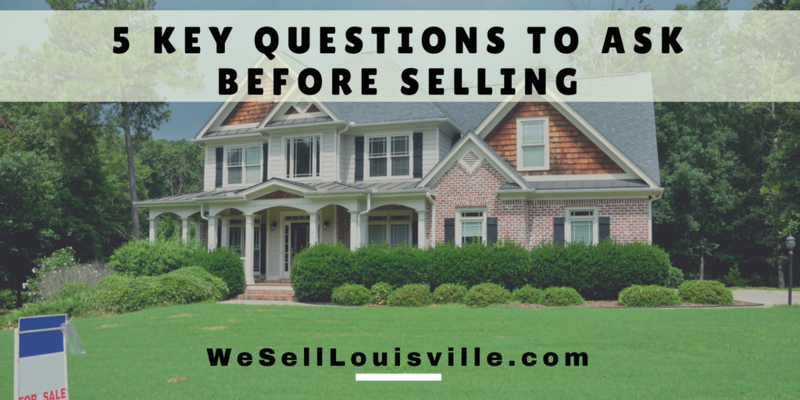 Because we work throughout the Louisville area and have it dozens of agents, we can partner you the agent that works in your area for a successful sale. Call us today or browse our website for more information or to connect with an agent near you.